Most Scottish clan tartans accepted as such today are no older than the first quarter of the nineteenth century. Many are much younger. The Johnston or Johnstone tartan first made its appearance in the apocryphal Vestiarium Scoticum, which was published in 1842 by two brothers who claimed to be grandsons of Bonnie Prince Charlie. The Vestiarium Scoticum purported to be a copy of an ancient manuscript detailing the tartans of the various clans, but it was almost certainly a forgery. Nonetheless, many tartans revered today had their origins in this work. In spite of the doubtful source of many of them, clan tartans have remained very popular and and have come to symbolyze Scottish culture to most of the world. 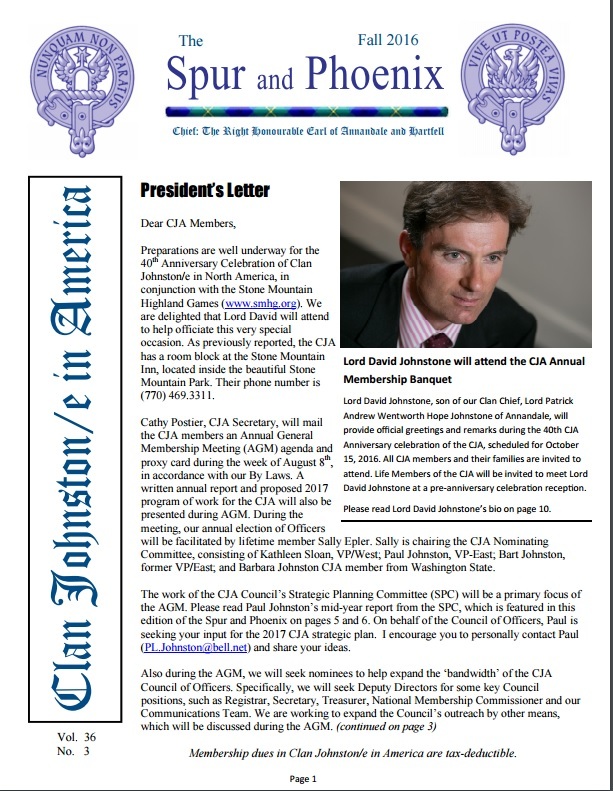 By now, clan tartans have become standarized and have developed a tradition of their own. 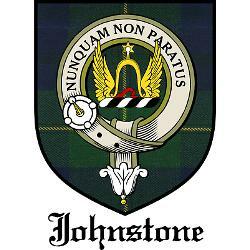 I am proud to wear the Johnston/e tartan, even though I know it had nothing to do with the Johnston/es when they were a functioning clan. People sometimes mistake the Johnston/e tartan for the Gordon tartan. Actually, the only thing they have in common is the green, blue and yellow colors. There are a number of tartans with these colors, but it is the pattern, or sett, which really distingishes one tartan from another. 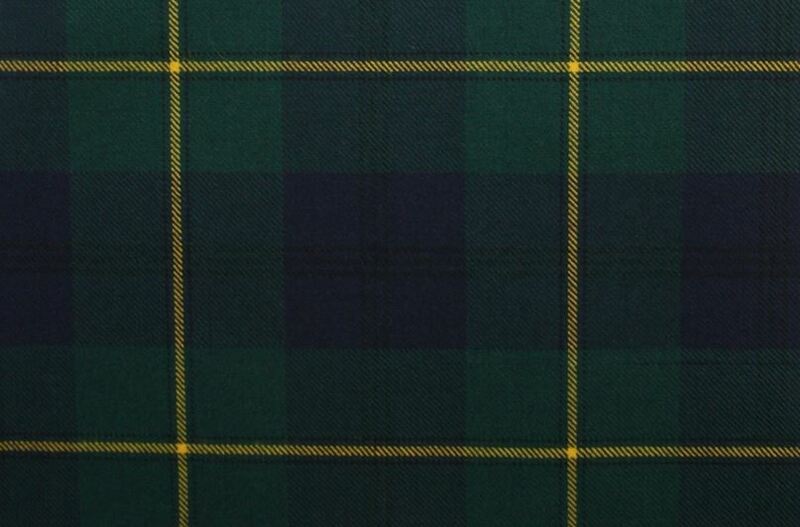 The Johnston/e tartan is fairly simple, and is composed of alternating broad stipes of blue and green. The blue stripe has three narrow black stipes running through the middle. The green stripe also has three narrow stripes in the middle, but the center narrow stripe is yellow. The alternating pattern is woven in both directions (warp and weft), forming a symetrical check. Usually it is made in a twill weave, which means the weaving is done “over two, under two.” See the pattern at the bottom of the page. When the Johnston/e tartan is woven in deep, dark colors, it is termed “modern,” which simply means that modern chemical dyes have been used. When woven in soft, muted colors, simulating vegitable dyes, the tartan is termed “ancient.” A third version, usually termed “weathered” or “reproduction,” has colors which are supposed to look like tartan which has aged a long time. The crest badge is supposed to be derived from the custom of having the servants of great men wear their masters’ crests on their clothing. 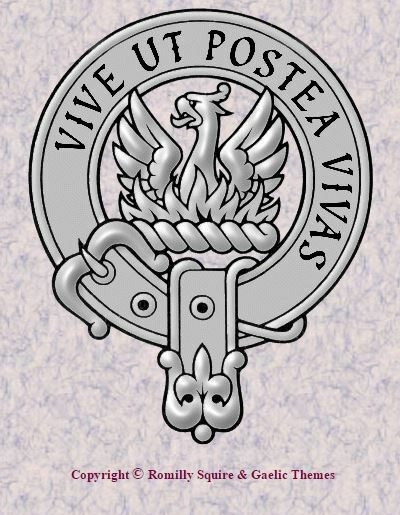 Similarly, it is claimed that clan chiefs gave representations of their crests to their followers. In any event, the present custom probably dates from the Victorian era. 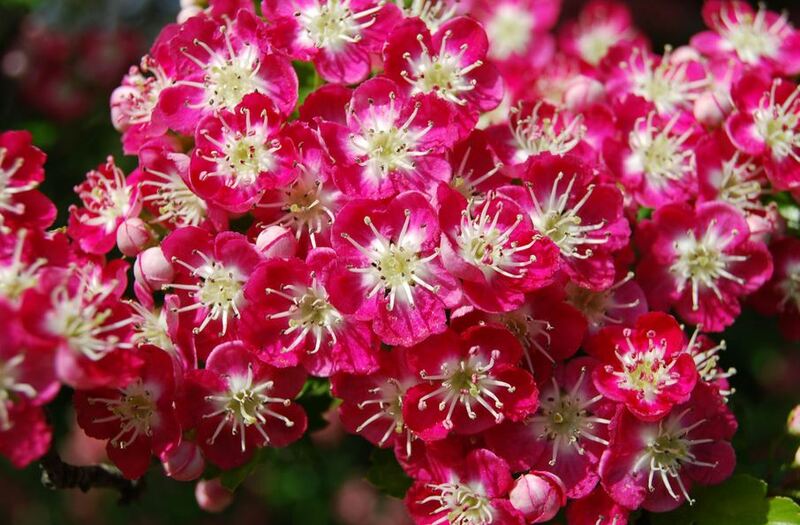 Red Hawthorn is the plant badge of the Clan. This is probably an invention of the nineteenth century tartan mania. 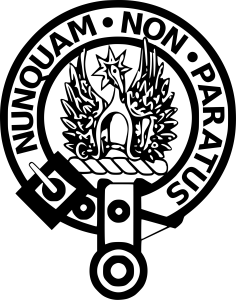 Border clans did not use plant badges which were characteristic of highlandclans. Sometimes the Chief’s present motto is translated as “Ready, Aye Ready” or simply “Aye Ready,” which is also used as a slogan.